You are buying Abbott Promote Nutrition With Fiber Ready To Hang 1000ml Case of 8, model #62703. ADW Diabetes offers a complete line of enteral feeding supplements for both children and adults. The Abbott Promote Nutrition With Fiber Ready To Hang 1000ml Case of 8 is a complete, balanced, very-high-protein formula for adult patients who need a higher proportion of calories from protein. It is ideal for patients with low caloric and/or wound-healing needs and patients at risk for protein-energy malnutrition or pressure ulcers. 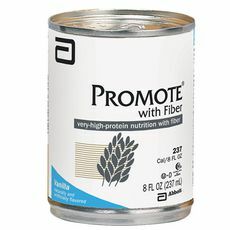 Promote is available in formulations with and without fiber for oral and tube-fed patients. Can be used for tube or oral feeding. Can be used for supplemental or sole-source nutrition. For use under medical supervision.